Expect approximately 5 minute – 25 minute install time. *Radio Shack carries these for under $1.00. Purpose: This mod will serve several purposes for your car. This modification is specific to the six (6) speed manual transmission cars ONLY. This modification is to deactivate the solenoid in the transmission that locks second (2nd) gear out when when the Skip Shift light illuminates. When the resistor is installed the dash light will still illuminate but the solenoid will NOT activate. This will allow you to shift to second (2nd) gear instead of having to go to fourth (4th) gear. This modification does NOT look very professional and most dealerships will notice the addition when they work on your transmission. This is the best reason for buying an aftermarket setup. However, not all of us have money trees in our backyards. 1. 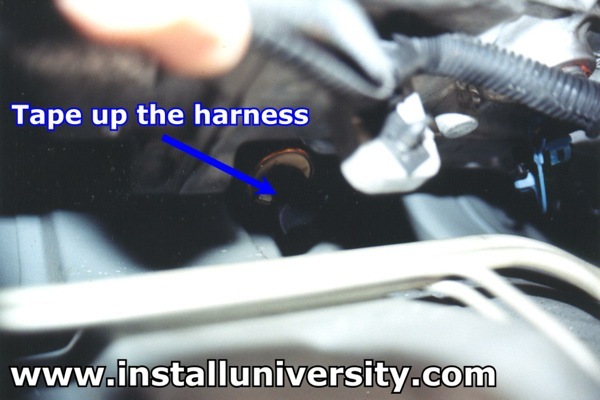 You will need to raise the front of your car so you can get to the transmission on the under side of the car. We chose to use our set of rhino ramps instead of using a floor jack and stands. Be sure you chock the rear wheels and set the emergency brake! 2. 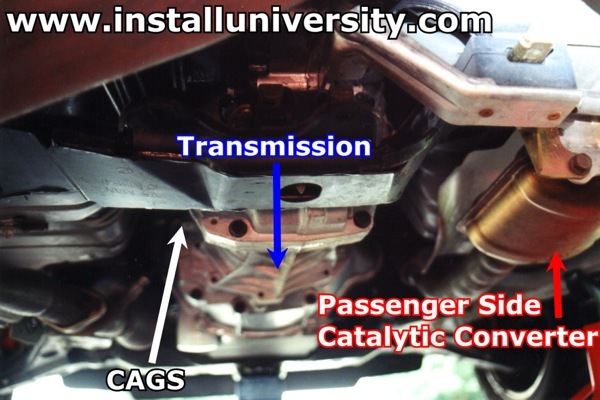 Get underneath the car on the driver's side and locate the transmission (see blue arrow in Figure 1). Figure 1 was taken from underneath at the rear of the car looking forward. 3. Locate the skip shift solenoid up high on the transmission and toward the front of the car (see blue arrow in Figure 2). This solenoid will be located closer to the engine than any of the other two (2) solenoids found on the drivers side of the transmission. 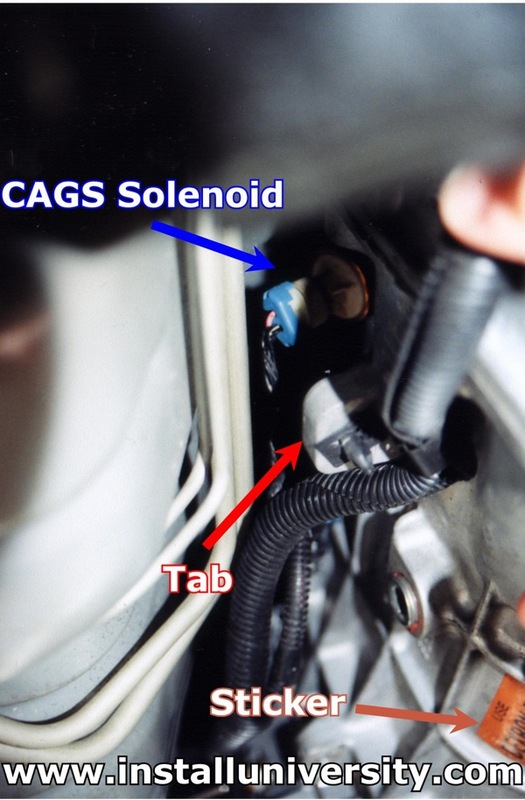 Looking at Figure 2 and the transmission you should be able to locate the solenoid by looking for identifying marks. 4. 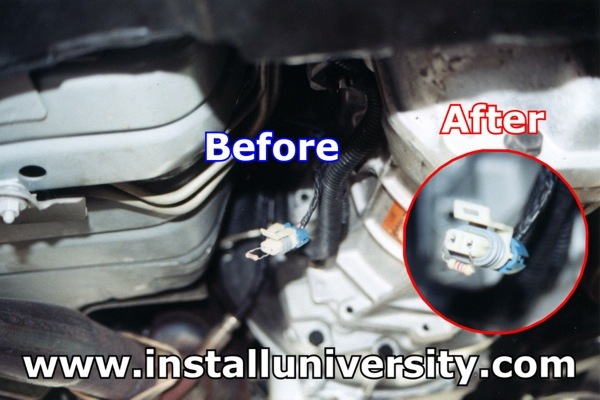 Unplug the solenoid by gently lifting the tab and pulling back on it. 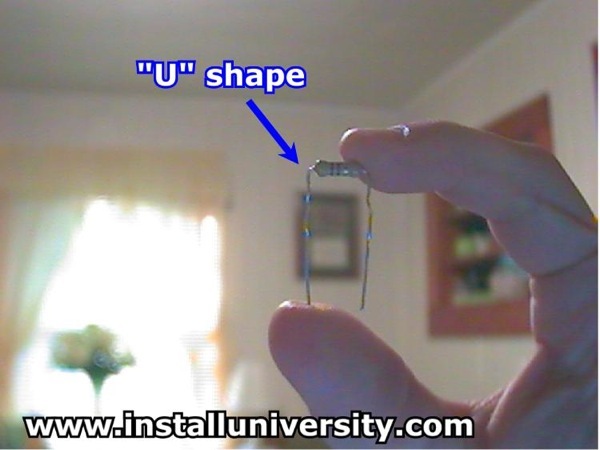 Take your resistor and bend it in the shape of a "U" (see Figure 3). 6. Now grab the female connector (the end that plugs into the wire) and place each end of the resistor into each receptacle on the connector (see Figure 4 below). Be sure to bend the resistor back so you can tape it up a little easier. 7. Then you can use electrical tape or equivalent to seal the connection from water and other weathering (see Figure 5). Just make sure you can remove whatever you use to seal the connection with just in case you want to remove it for a dealer visit or other reason. 8. You will need to tape up (seal) the connector end on the transmission (male end) up just like you did the female end. You can use electrical tape, equivalent or plug (see Figure 6). Just make sure you can remove whatever you use to seal the connection with just in case you want to remove it for a dealer visit or other reason. 9. Now zip tie the loose line to a near by line to keep it from dangling free and possibly being ripped off or damaged. 10. Remove the car from the jack stands and take your car for a short drive to make sure it works. You will want to pull out slowly and make the skip shift light activate so you can take the car to second to make sure it works. Your skip shift light will still activate so do not be alarmed when it does. The solenoid should not activate though making it possible to go straight to second gear. If it fails then you have done something wrong. 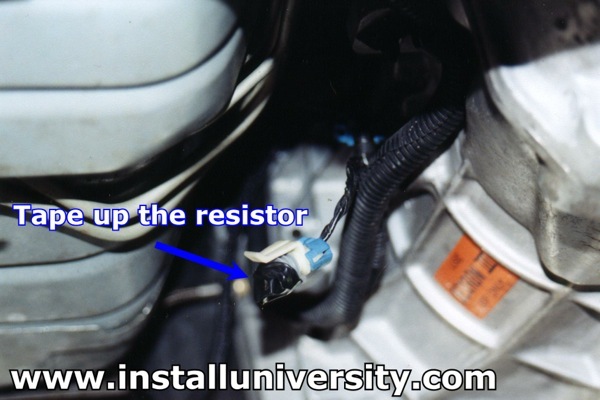 The most common mistake made is to unplug the reverse lockout solenoid and place the resistor in that connector. This will make it almost impossible to shift into reverse. If you have this problem reconnect the solenoid and start from the beginning and find the correct solenoid. Comments: This is a good modification to your car. You no longer have to worry about going to fourth and skipping second. This is especially useful if you pull out into traffic sluggishly and then realize you need some oomph to get clear of a car you did not see. The light will continue to function on the dash but this is not a concern as discussed earlier so just ignore it.